Thanks to Darth Pooh on our forums for the awesome tip: the Palm Pre’s firmware has been updated from version 1.0.1 to 1.0.2. Number changes like that indicate that it’s a maintenance release of some sort to improve stability, speed, and whatnot on the device, and as Pooh noted, the Pre is running notably faster than it did back at CES, though there is still some lag. But wait, there’s more! Darth Pooh got the chance to check out a new Sudoku application, noting that it was “somewhat playable,” but not up to par with what we’d expect from companies like professional game developer Astraware. He also caught sight of ‘another Twitter program,’ so rest assured all ye Tweeters, your options will be many. Buyrihn, also in our forums, got some of his own hands on time with the Pre. When he got it, the manager had something like 10-15 applications running at the time and claimed that they caused little lag. Pooh meanwhile has discovered that, as one would expect, running processor intensive applications like Pandora or playing music will cause a slowdown in application launches, but once they're up they run just fine. Oh, and buyrihn also caught a picture of something that we know many of you have been clamoring for: a third-party an alarm clock application (pictured in blurry cam vision up top). The app supports multiple and repeating alarms and can display both an analog or HTC-style digital clock. Like Palm said, they decided to leave alarm clocks up to third parties and the third parties delivered. 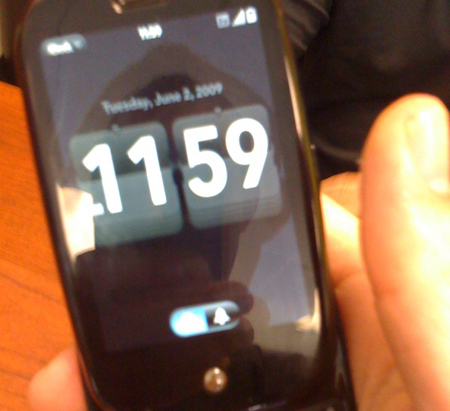 Correction: We have confirmed that the Clock application is actually the work of Palm, not a third party. Sorry for any confusion there.